Cubie Street School (Annfield) the photo was taken in the school hall. March 2006, George Thompson, Kidderminster, England. 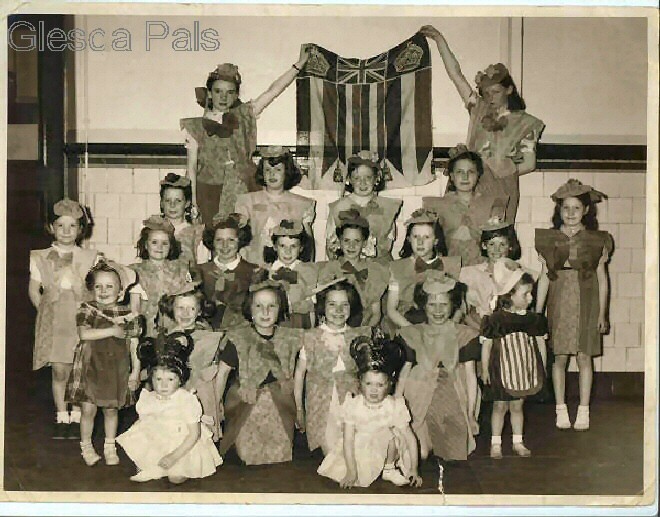 Hi Webmaister, I attach a photo of some young people who held a concert to celebrate Elizabeth II coronation in 1953 the children would have come from Lochiel St. Cubie St. Forbes St. and around. Hi Webmaister, have been in seventh heaven looking at all the old sites of Brigton since my mother put me in the direction of your website. I would like to tell George Thompson from Kidderminster, Weans 1953 celebrating the coronation in 1953. 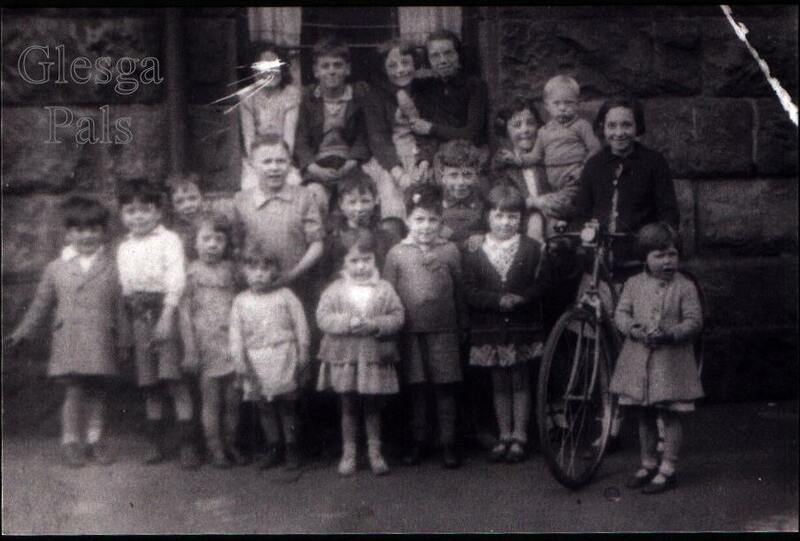 The two wee lassies in the frothy dresses at the front are my cousins Doreen and Irene Given, also residents of Locheil Street. Apparently I am in the area somewhere but was just a little bit too young to participate. Looking forward to letting my aunt and uncle see their offsprings on the net. Webmaister I am Robert Allan, now living in Pickering, Canada. 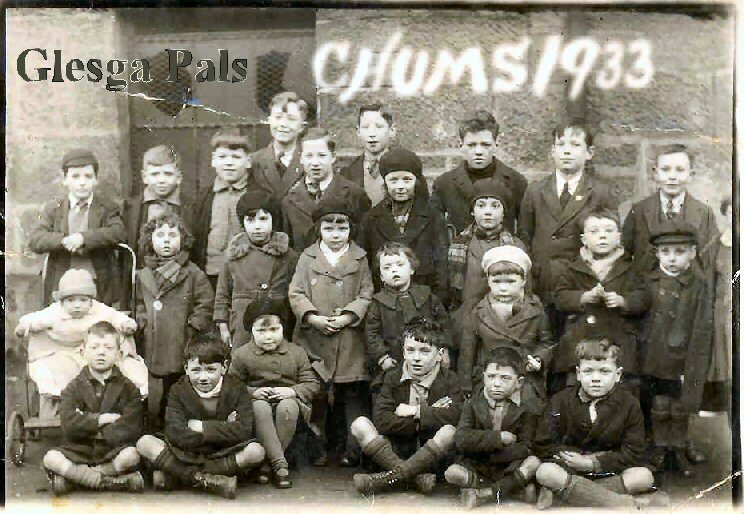 The photograph is kids who lived in, or around, Agnes Street in Maryhill. The tenement is long gone. Let me introduce them please. Back row, three from right is Roderick Campbell MacKenzie, ( Eric ), born 1920 died 1934 of meningitis. Row3, three from left is Gordon William Mackenzie.born 1922 died 1943. Radio operator/air gunner in Lancaster No. 5000 missing presumed dead. Row2, standing, three from right ( light coloured Tammy & "piece" in left hand ) is John Livingston MacKenzie, ( Ian ) born 1929 and Died 1991 in Chicago, Illinois. Webmaister : Robert a fantastic street photograph from 1933, you don't get them like that anymore! A lovely tribute to your cousins. 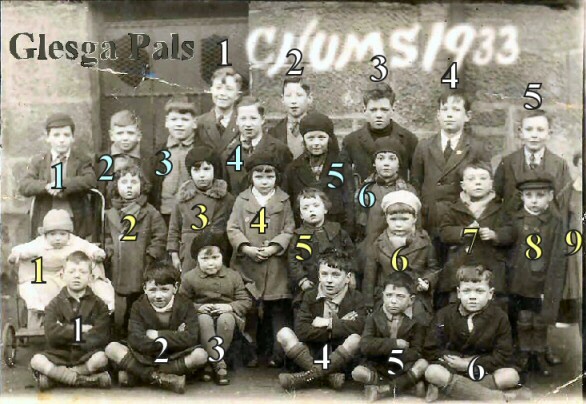 July 2007, email from Brenda Given..... Webmaister Glesca weans 1933 Row 3 position 5 is Sylvia Skilling who was my father's cousin.